Another responsibility of the Obedience Training Committee is the conduct and running of all trials which include tracking trials. 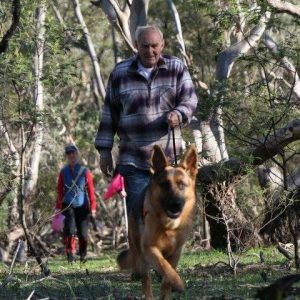 We hold an Open Tracking Test Trial on the long weekend in June which is open to all breeds of dogs, not just German Shepherds. To do this a large area of land is required and we are fortunate that farmers provide land for us to run our trials on. As usual many people are required to set up a Tracking Trial as tracks have to be laid out prior to the dates of the trial and maps drawn for judges, stewards and tracklayers and catering for the weekend organised. If any club member would like to help out with setting or assisting with stewarding, tracklaying at trials or re training their dog please contact the Obedience Committee and we will certainly appreciate any help you can give at trials and pass on information as to which branches have tracking training. 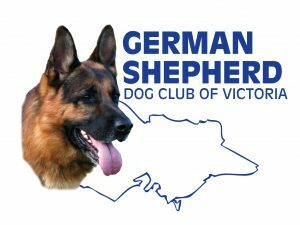 Our club has been holding tracking trials for many many years and we welcome entries from all breeds people as well as GSD owners. As most of you would know all dogs can track – if they could not then they would not survive. At birth they must locate their way to their mothers teat to live – if they lived in the wild they would have to locate prey by tracking them down so they could eat and this they do mostly by the quickest and shortest method using all the facilities nature has given them. 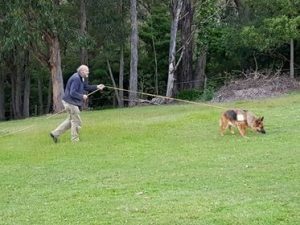 Tracking that we carry out at trials is totally different to that, in that we ask the dog to track to a pattern that we set out in the bush or a paddock, following it intensely, taking the corners and finally finding the tracklayer at the end of the track. To do this we need to teach the dog what we require them to do as if it was up to them they would find the tracklayer but not necessarily following the pattern we have set out for them. 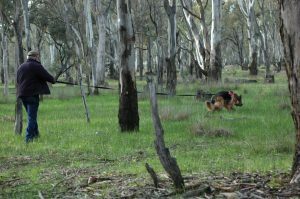 Different tracking tests require tracks to be set out with length of track, number of corners, number of articles left on track for dog to indicate to be in accordance with the rules and regulations of the Aust National Kennel Council. These rules are set out on the ANKC website with specific rules/regulations for tracking trials. 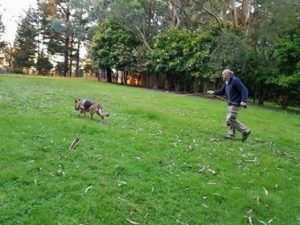 In teaching dogs to track the handler MUST remember that the dog has to track with no interference from the handler who is there to recognise and read that his/her dog is tracking and follow along accordingly. If the dog loses the track then the handler can work the dog so that they may pick up the track again with the handler recognising when that happens and then proceed onto the finish, but the handler must not presume or think where the track goes as they usually are very wrong. Leave it to the expert – your dog. If they have been trained properly then you as a handler will be confident of their ability. Tracking requires a harness for your dog and a long lead. You also require articles which are usually old socks (preferably wool) as they hold the scent of your body better than the synthetic ones. Articles must be on your body for at least half an hour before you lay a track for your dog. Tracklayers must use their own socks in laying tracks. You do not use other peoples socks as they will have a different scent to you and will confuse the dog. I would like $5 for every time I have heard the owner of the dog ask the tracklayer if they wanted the owners socks to lay the track – the answer is a big NO. As always with dog training it cannot be stressed enough that if the basics of tracking are taught to the dog correctly and thoroughly then the dog will be able to track well and achieve titles. Tracking must have discipline – in that I mean that you the handler are disciplined in how you lay the track, how you have all your tracking equipment stored in a bag, wearing your articles for at least the required time, how you dress your dog in its tracking harness in a quiet and confident manner and the way you approach the start of track always in the same way thus providing the dog with a uniformity of how tracking is tackled, which will create a harmony between you and your dog that will become an understanding, giving both of you confidence in the task at hand. What tracking titles are available? There are some tracking books in our club library and there are lists of all library books, videos etc at branches. To get a book from the VCA library at KCC Park you contact the library – if in person show your membership card and they will loan you the book – if by phone then you can quote your membership number and follow what they require you to do from there. Tracking with your dog can be a most rewarding discipline to you both, with you because you as a handler are totally reliant on your dogs ability to take part in the sport of tracking and with your dog because if you have trained them well tracking will be easy for them and rewarding to both dog and handler alike. Contact the Obedience Training Committee for any info or questions. If you are interested in competing, you can also read the education flyer here which has lots of information.